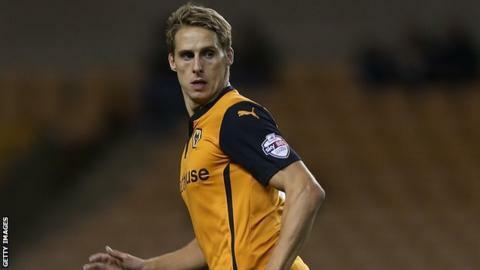 Wolves picked up their fourth win out of the last five games as Dave Edwards' second-half strike proved enough to defeat Blackburn. Edwards struck from the edge of the area after being set up by Nouha Dicko, before missing a chance to make it 2-0. Dicko also hit the bar for Wolves, while Rovers went close when Richard Stearman directed the ball against his own post. Victory moves Kenny Jackett's side to within a point of the play-off places. Blackburn remain 10th and will be disappointed not to have made the most of their possession in the first half. Ben Marshall headed a Jordan Rhodes cross wide and then forced a save out of Carl Ikeme from a free-kick. Wolves improved after the break and Dicko's invention set up Edwards to score what proved to be the only goal of the game. Rovers almost had a leveller when Stearman misjudged a clearance and headed against the frame of his own goal. However, the visitors held on and could have won by a more handsome margin but Dicko's curling effort smashed back off the bar, while Danny Batth headed over a great opportunity. Match ends, Blackburn Rovers 0, Wolverhampton Wanderers 1. Second Half ends, Blackburn Rovers 0, Wolverhampton Wanderers 1. Foul by Chris Taylor (Blackburn Rovers). Rajiv van La Parra (Wolverhampton Wanderers) wins a free kick on the left wing. Substitution, Wolverhampton Wanderers. Ethan Ebanks-Landell replaces Jack Price. Attempt saved. Joshua King (Blackburn Rovers) right footed shot from the centre of the box is saved in the bottom right corner. Assisted by Chris Taylor. Corner, Wolverhampton Wanderers. Conceded by Shane Duffy. Substitution, Wolverhampton Wanderers. Matt Doherty replaces Nouha Dicko. Attempt saved. Craig Conway (Blackburn Rovers) right footed shot from the right side of the six yard box is saved in the bottom right corner. Assisted by Jordan Rhodes. Attempt saved. Nouha Dicko (Wolverhampton Wanderers) left footed shot from outside the box is saved in the centre of the goal. Assisted by Jack Price. Nouha Dicko (Wolverhampton Wanderers) wins a free kick on the right wing. Substitution, Blackburn Rovers. Joshua King replaces Lee Williamson. Offside, Wolverhampton Wanderers. Kevin McDonald tries a through ball, but Nouha Dicko is caught offside. Offside, Wolverhampton Wanderers. James Henry tries a through ball, but Dave Edwards is caught offside. Substitution, Blackburn Rovers. Chris Brown replaces Rudy Gestede. Attempt missed. James Henry (Wolverhampton Wanderers) right footed shot from outside the box is high and wide to the right. Assisted by Dave Edwards following a fast break. Attempt missed. Rajiv van La Parra (Wolverhampton Wanderers) right footed shot from the centre of the box is high and wide to the right. Nouha Dicko (Wolverhampton Wanderers) hits the bar with a right footed shot from outside the box. Assisted by Jack Price. Substitution, Blackburn Rovers. Craig Conway replaces Alex Baptiste. Attempt missed. Dave Edwards (Wolverhampton Wanderers) right footed shot from the centre of the box is high and wide to the right. Assisted by James Henry. Attempt missed. Danny Batth (Wolverhampton Wanderers) header from the centre of the box is too high. Assisted by James Henry following a set piece situation.